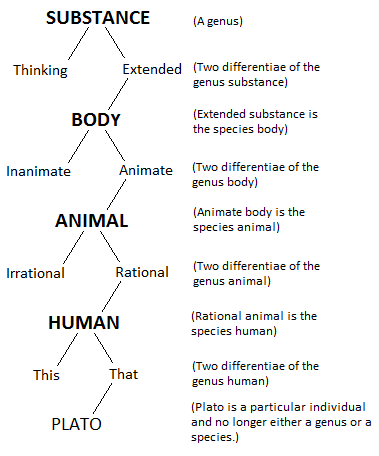 Porphyrian Tree Hugger and the Rational, Sensible and Virtual. Have you seen this guy? What adjectives come to mind when you look at the picture? Cuddly, sweet, adorable? This is how I have hear several kids refer to it recently. 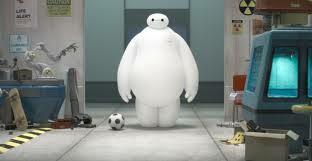 His name is Baymax and he appears in a recent film called Big Hero Six. I haven’t seen the movie and cannot speak to its plot or intention. Rather I mention it because of the extreme peculiarity of the thing and these qualifiers being attached to it. Study the picture for a good moment and decide for yourself what you see. I know what I see. But more on that in a moment. In our age of privilege, leisure is no longer true leisure, rather apathy and overindulgence, and entertainment has gone from being an occasional respite, to a multi-billion dollar right. So with this abundance on our hands, what is it we pursue in these areas? Each has followed a confused path along the Porphyrian tree of being. 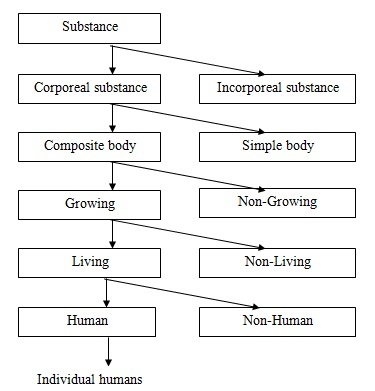 The Porphyrian Tree is an epistemological tree shaped diagram used to illustrate, in this case, the metaphysical scale of being, both corporeal and non-corporeal. It depicts the logical division of the genus, being or substance into successive dichotomies. One need only take a short drive to the grocery store to surmise that a monumental shift in our attention has occurred and that there is great confusion about what’s what on this tree. If it is true that man once largely pursued other human beings for love, in the modern world, he has aimed the arrow of his affections lower, starting with animals, and lower still, the inanimate world. And now he aims at something even Porphyry himself could never have predicted. The virtual beings. Let’s start with the animals. Some of the most rampant pursuits of “love” by modern man involve animals and pets. 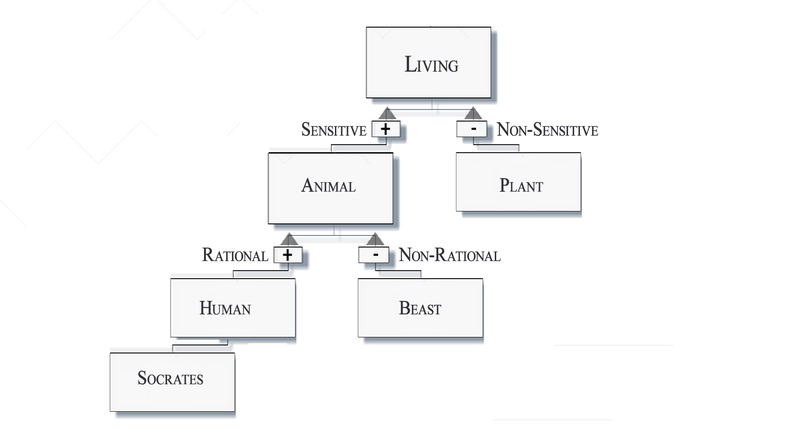 Certainly many animals in all of their varieties contain a great many positive qualities. These qualities make them worthy of a healthy amount and type of affection. However, It is no secret that a great segment of the population now worships animals, particularly their dogs. 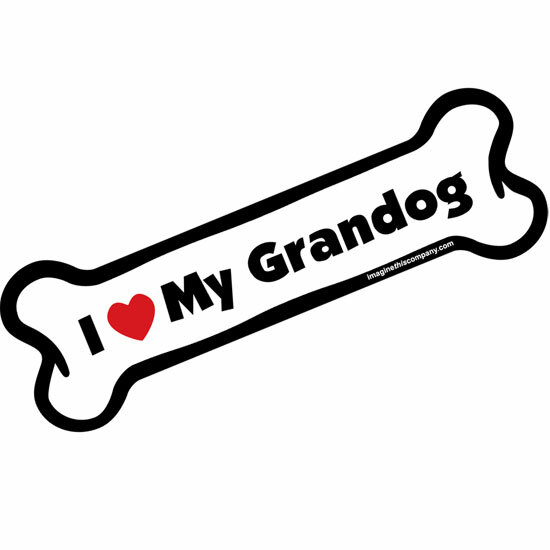 It is a rare thing to encounter a car without a “Who Rescued Who” dog paw bumper sticker, an “I Love My Grand Dogs” bone magnet, or even the epitaph I encountered recently, “I kiss My Dog On The Lips”. (Really no need for analysis there. It seems to speak for itself) But there are effects far more damaging than the recent glut of bumper stickers due to this elevation of the animal to an equal, or often a higher plane than man. (Dog lovers please; no burning bags of Fido’s good works on my doorstep for pointing this out.) One very clear example of this played out is that we see endless commercials about saving unwanted and abused dogs and cats, but never one on saving the unborn child. While animals and pets serve their purpose and are a source of joy to be treated respectfully, they are not the highest of the corporeal creatures. That would be us. Yes, humanity. But alas! What good is a human when you can chain yourself to a tree which leads to the next object. Again, our being the highest of corporeal creations comes with a great responsibility to the lower, according to Holy Mother Church. Consult the Catechism on this. It makes sense, as the Catholic faith is a faith of reason and logic. God is the ultimate Being of reason, and so it follows. This responsibility includes that owed to this grand and unfathomable gift of the cosmos, and more specifically our breathtaking corner of this little expanse; Earth. However, an important distinction must be made about this responsibility. It is not so much a responsibility to the natural world itself as inanimate objects have no feelings, physical or psychological, rather it is a responsibility owed to the living and animated inhabitants of course, and ultimately to the Creator. It is a dangerous proposition to place the kind of love onto nature that is reserved for only human beings. We respect and cherish the natural world because it is a profound gift and a perfect reflection of the order and enormity of the ultimate beauty and love (more on that in a future post). While it is unhealthy at best to ascribe human qualities and affections to animals and trees, there seems to be a new kid in town; the virtual pets. I am not referring to pets in the strictest sense of the term, rather an object of attention, attachment, affection, and perceived fulfillment. This can encompass the whole gamut of electronics, gadgetry, games and the like. But in the interest of time, let’s look at one specific kind as it relates back to Big Hero Six and the robot guy called Baymax. There are multimillion dollar companies peddling an endless stream of these virtual “pets”. 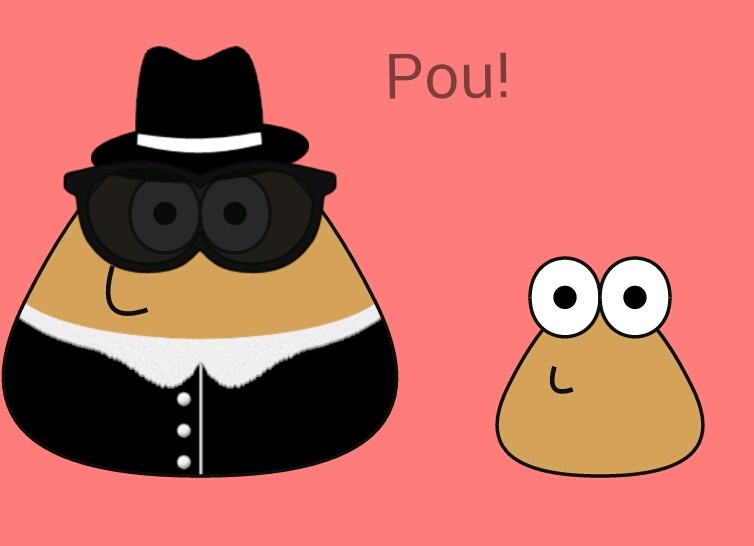 There is one I play with my children called Pou. It is essentially a little electronic blob with eyes and a mouth that you must feed, change, bathe, and play with to keep it “healthy and alive”. Strange, if we step back even a half a step. I have even caught myself describing Pou as “cute”, particularly while it is “young” and small. Notice all of the words in quotations given the fact that Pou is not even really a material substance. In reality, Pou is nothing but a bunch of colored pixels with an electronic voice over. And though this is in many ways innocent enough comparatively, one can certainly see not only how this is getting out of hand in terms of money and time spent, but also effecting a change in our attitude. It is having an impact on how our children and perhaps even older generations, view the world and the beings in it. I grew up a child of the 80’s (can I get an “Amen”?!) 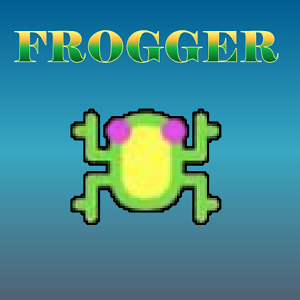 About all we had was the occasional waiting for your table at a certain restaurant Pac-Man, Donkey Kong, and Frogger. I never once heard anyone describe Pac-Man, Miss Pac-Man by extension (nor the frog for that matter) as “cute”, nor any other term of endearment. Never, not once. Human beings, with all of their being connected through social media and its electronic facilitators, are more lonely, isolated and lacking in love than ever before. And now we are looking not just to trees and animals but to electronics to “love” us” and to “love” back. Your eyes are the most beautiful shade of lavender. Looking into them is like seeing my soul staring back at me. 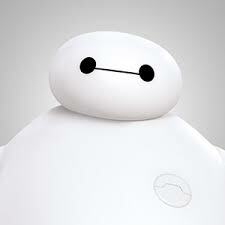 Back to Baymax the robot. What is it about it that is so peculiar? It’s not so much that it is a computer graphic animated into “being”. We are all, sadly, used to that by now. 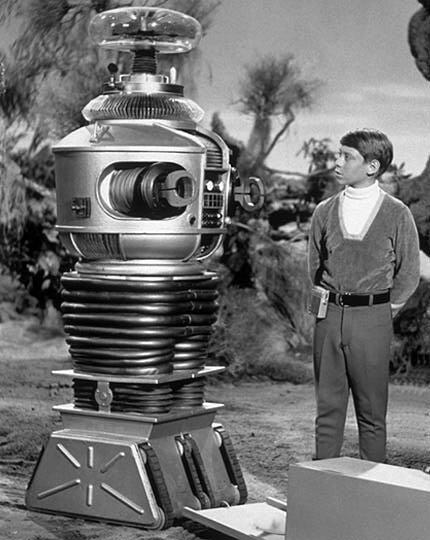 (Even our Lost in Space robot was made out of actual cardboard boxes, tinfoil and Slinkys.) But what is strange is the actual look of the thing. Though not outwardly objectionable nor offending, there is something still very wrong in how it looks, something almost hard to pinpoint as it is not entirely unappealing in appearance and yet somewhat terrible in its lacking. (Does this sound like anyone else we know of?!) It is in the blank emptiness of the thing’s appearance. The vacuousness, devoid of anything resembling actual flesh and blood human life. The nothingness. And nothingness is bleakness. And bleakness is hopelessness. And hopelessness is nihilism. That theory of absurd purposeless existence without a grand order accorded by our loving Creator. Note the juxtaposition. Who has whom figured out? Maybe you think I have gone too far in my analysis of this white blob, and I am sure he is a really standup guy in the film, but in today’s modern context then again, perhaps this is not completely far off. If art imitates life, then in fact it is not far-fetched at all. We do live in a nihilistic world, one that seeks to fill this vacuum. Nature abhors a vacuum. This includes our human natures. And we are continually trying to fill the vacuum with more illusion. And the illusion is getting more illusory by the minute. Man used to try and fill himself up with only good old-fashioned disordered material things, now we have added to that list, the virtual. Now we have this white blob. There is little doubt that a creation like Baymax would not have been well received back in my day. It is likely that no one would have been drawn to such a thing, no matter how quippy and clever his mile a minute one-liners may have been. People would not have been able to “get him” back then, but they do now. This speaks volumes about our modern day understanding, or lack thereof, about the nature of being. Another aspect of this all is that none of this virtual surrogate parenthood or companionship is teaching our children what the world is promising it will; love and respect and unity among fellow humans. Instead, it is teaching us to not only put our time and money and attention into things that are in fact not even really there, but to take all of this affection off of human beings. As a result, we are viewing other humans as beings unworthy of love and compassion. We have an overabundance of each, for inanimate objects, with little left for people. And why? Because, trees, dogs, and virtual beings now, never “let us down”. Newsflash: Human beings have been letting each other down since the dawn of time. (A story comes to mind about a garden.) But they are still the only items on this list capable, through their free will, of returning love. Does humanity hold anything worthy of endearment anymore? If we keep operating under the assumption that the answer is “no”, then soon it won’t. This means not just in our perception of others, but in their acts. In short, If we view people as unworthy of love, it will soon follow that they will start to act in the same manner. A being must receive love to know love, whether from humans or the ultimate love from our Creator. The latter is a gushing well that is highly neglected, and fewer and fewer attempts are made at the former. This is already a current and continuous tragedy, hurling toward catastrophe. We hear repeatedly about a person’s dog and its “unconditional love”. But what about actual unconditional love between deeply flawed and yet loving and yearning human beings? I have experienced and do experience this act of the will daily. My husband is one who unconditionally loves. No matter my weakness or selfishness, and a whole slew of other “ness” words, he is there with the tireless work of love and an exceedingly short memory. I am not sure why except that he must truly understand what is meant by the term Christ-like. As a mother I certainly experience this with my children. No matter their mistakes or quirks of personality or their flaws, they remain to me beautiful, tender little beings who grip my heart to the point where I can physically feel it in my chest. Of course there is no denying that unconditional love can be difficult. Nonetheless here we are, sinful and marred, with intellects, and complicated psychologies, and utterly unique histories, and that glorious, frightening thing: free will. And yet we still use that free will to love each other unconditionally. This is nothing short of a miracle. And it is made possible only because we were created not out of necessity, but out of one thing only: an infinite, unyielding and mysterious love. This is the beginning and end of it all. Now back to that Porphyrian Tree. Consult the tree and you will see that we knew far more about ourselves and all of this in the year 200 AD than we do now. Our beautiful world is made up of the rational, (humans) the sensible, (animals) and the rest, and now we can add the strange and unforeseeable category of the virtual. But in the several hundreds of years since, each of these categories of being and our understanding of them has gotten all mixed up. It has become like an artificial Christmas tree that we have taken upon our inept selves to reassemble. And the branches have been placed in the wrong holes in the trunk. Many of the elements (the branches) are assigned qualities of being that simply do not exist and never will, while robbing those intrinsic qualities from those who do actually possess them by their nature. And instead of growing upward toward the sun, this tree seems to be rotting in the ground. Surely the handiwork of our enemy. He is the master of chaos and confusion, which he often disguises as great concern. Good, he portrays as bad and bad as good. And then nothing makes sense; goodbye to natural law and reason. Goodbye to true love. But we need to revisit, recover and reorder this Porphyrian Tree on both the grand scale; the greater order, and small scales; the order in our souls. This is the tree worthy of hugging, because it encompasses the highest abilities of our intellect, to reason, to contemplate and to seek truth, and points to this order, which makes not only perfect, but beautiful sense. Because it came from He who is perfect in reason and in beauty. Worthy of a lifelong embrace indeed. Is it a leap, to go from Big Hero Six and the white blob to nihilism? Perhaps. But perhaps not. The effect of modern man elevating the non human creations to a point higher than their natures, is that it is at the cost of embracing humanity and the opportunities for love offered therein. Nature abhors that vacuum. And so our rejection of somethingness (mankind) or everythingness (the Divine Being of the Godhead) is the embracing of nothing things (the white blob), and nothingness (Nihilism). This is hard to recover from, once in place. So, in a world of virtual goods, beings, and reality, and their perceived good, let us seek the actual of each of these. They are there. And they point to a nature whose origins are in a goodness that has nothing virtual about it. Blessed Sebastian is another Oratorian saint! His great work was among the poor and he was a faithful priest in the administration of the sacraments. The two lessons we can take from Blessed Sebastian is how he overcome his petulence (where was easily offended by others) with great patience as well as how he overcame long periods of great dryness in prayer and in his spiritual life with unwavering fidelity. He is a fantastic example of obedience and humility. Blessed Sebastian, Ora Pro Nobis. This is not how man ought to live! A dear friend, just yesterday, informed us about the Catholic Land Movement and then the blog post below showed up in our e-mail this morning. There are no coincidences! As we humans fight to think and try to live a more contemplative life, so we are able to do the greatest thing, which is to contemplate God, getting back to nature is the best way to do that these days. The article below is written by Jason Craig, and appeared on the Catholic Gentlemen blog this morning. http://www.catholicgentleman.net/. We can’t say enough positive things about the Catholic Gentlemen blog. We recommend you “follow” it so you receive their posts in your e-mail. More Information on Mr. Craig appears at the end of the article. When the Papacy is vacant the whole Church looks longingly for a puff of smoke from a little chimney – the household of the Church feels lonely without Papa. When it comes we rejoice, because our father has come home. When I see puffs of smoke from little homesteads in the countryside I feel the same – a father has come home to be with his family by living together on the land. I can’t say it any better. Men are moving back to the land for their families and as a response to the “signs of the times”. And you can put that negatively, bringing up the need to flee the horrors in cities or the vapid banality of the suburb, or positively by bringing up the need for family farms providing quality food to their neighbors. Whatever the motivation, something is happening. I’m here to encourage those of you that feel this movement: pursue it! You’re not alone either. G.K. Chesterton dedicated the end of his career to writing about recovering an agrarian and craft-based culture through what came to be called “The Catholic Land Movement”, a movement he would sum up simply as: “Three acres and a cow.” He was joined by other brilliant men like Hellar Belloc and Fr. Vincent McNabb, author of The Church and the Land. The rise and fall of this movement is fascinating, but the point is that you are not the first Catholic to look around and have that guttural reaction: this is not how man ought to live! Some people will roll their eyes and scoff at the idea that we need more young farming families, seeing it as silly idealism, but I can’t see a need more real than food and family – can humanity go on without the two? Yes, you’ll be accused of “turning back the clock”. And? “The question is not whether you can set back the clock,” pointed out John Senior. “Of course you can. Clocks are instruments…” We farmers and homesteaders aren’t reactionaries or extremists, we simply want to live as men have lived since the dawn of time and still do the world over. We feel like Joseph and Mary wandering in Egypt longing to return to the Promised Land. The scriptures, especially the Psalms, paint the happy man as a man blessed by his family and the land: “Blessed is every one that feareth the LORD; that walketh in his ways. For thou shalt eat the labour of thine hands: happy shalt thou be, and it shall be well with thee. Thy wife shall be as a fruitful vine by the sides of thine house: thy children like olive plants round about thy table” (Ps. 128). Pope Pius XII, echoing the long tradition of the Church, praises farming thus: “God gave man the earth for his cultivation as the most beautiful and honorable occupation in the natural order” (emphasis added). Today we are not only utilitarian of each other, but also of the land, forgetting how to wonder and enjoy. We confuse knowing about a thing with knowing a thing. Our use of each other and nature mingled with our prideful spirits of doing and building make us forgetful of the spirit of reception, which is essential to wisdom and salvation. But it’s not just the intimacy with the land that brings the homestead to life, but intimacy with your family. I think the witness of fathers bringing their families to the farm is important for the broader agrarian movement, not only because family-less farms have a short economic shelf life (who keeps it going? ), but it’s the full flourishing of the human person not just in nature but in a family. “You can’t have family farms without families,” Chesterton pointed out. This land and family affair is just plain good for men. Pope Pius XII, having already witnessed the effects of industrialization, which separated fathers from nature and family, said that farming is “so close to nature and based so substantially on the family,” that it is known to “produce altogether different men.” In my experience so far, that’s very true. Here’s an example of nature, family, work, contemplation, and prayer coming together on the homestead: We decided that this winter we’re only using wood to heat our home. We have natural gas, but, well, I don’t like it. Yes, the gas is cheap and easy, but that thing drudged up from the darkness under us doesn’t compare to the gift of kindling which falls as a gift from above and is literally stored sunshine (that’s what a tree really is). The cutting, chopping, stacking, and drying that my family and I have to do constantly (and it is a chore!) bring us together around a unified work, filling our time with an activity that is both deep in meaning and fulfilling, and cultivates a spirit of gratitude for the earth’s abundance. As the Psalmist said, we are blessed “by the labor of [our] hands”. (And not one part of it is taxable!) This direct contact with the world and each other cannot be recreated anywhere else, without artificiality akin to a petting zoo. We homestead together. We all watch for signs of spring – swelling buds on the dogwood out front and new grass in the pasture that the chickens, cows, and pigs will turn into eggs, milk, and meat. We know what seed on rocky soil does. We know that grapes only fruit well when pruned. Christ’s words are all around us. When we first got out to the country the kids were bored. In the city we had basically lived a life of entertainment – how to we keep the kids occupied? Questions like that never come up now – there’s always work and simple fascination right outside. And we work and are fascinated together. We don’t have a TV but I can promise you a thunderstorm crawling over the hills can’t be recreated with computer graphics. Have you ever seen a child chase a firefly in a pasture? Oh it’s good. And it’s obviously something that has to be re-learned because when friends and family come to visit they always want to go somewhere – an attraction up the road or a neat store in the next town up. This home-centrism is odd to them. And we homestead with neighbors. There is no spirit of competition out here. Excellence comes from communion with your neighbor not out-smarting them. Farmers give away secrets, and will stop in to tell you the latest piece of wisdom gained. Men help men because it’s right, not just when it benefits them or helps their profits. That’s love. It’s more than systems and economics out here. “Rats and roaches live by competition under the laws of supply and demand,” said Wendell Berry, “it is the privilege of human beings to live under the laws of justice and mercy.” And for those that think you can’t evangelize or witness to the Gospel in a rural setting I say: “Huh?” People with souls live out here too, and I have found that the deep spirit of community lends very well to witnessing to our Faith. And as a father the great blessing is to be able to spend time with kids without simply being at the house. In the city, when I took time off to “just be with the family” it was actually kind of awkward. I basically just did stuff that my wife normally had to do alone, and as fun as it was it was a sort of disruption of the order that would need to be rebuilt when I left again for work. Helping your wife is good and necessary, but on the farm there is a sort of domain that I get to bring them in to which integrates seamlessly with the world inside. The homestead is an extension of the house into a household, with levels of activity and work suited to different ages, etc. Its more than just “being home more”. Now, I might be accused of being romantic, but the reason farming sounds so romantic is because it is. Sure, the reality of it involves blood, dirt, and manure, and its really hard, and sometimes that’s the case just with kids long before you step in the barnyard. There are neighbors here that will steal as fast as anyone in the city, and the beloved agrarian culture you read about in Wendell Berry novels is long gone, replaced by Dollar Generals, monoculture farming, and empty mills. And I also recommend that you give up the grandeur parts of your ideal: big colonial farmhouses and endless pastures. The reality will be much humbler. But, like I said, I think we are in a movement of recovery and rediscovery. 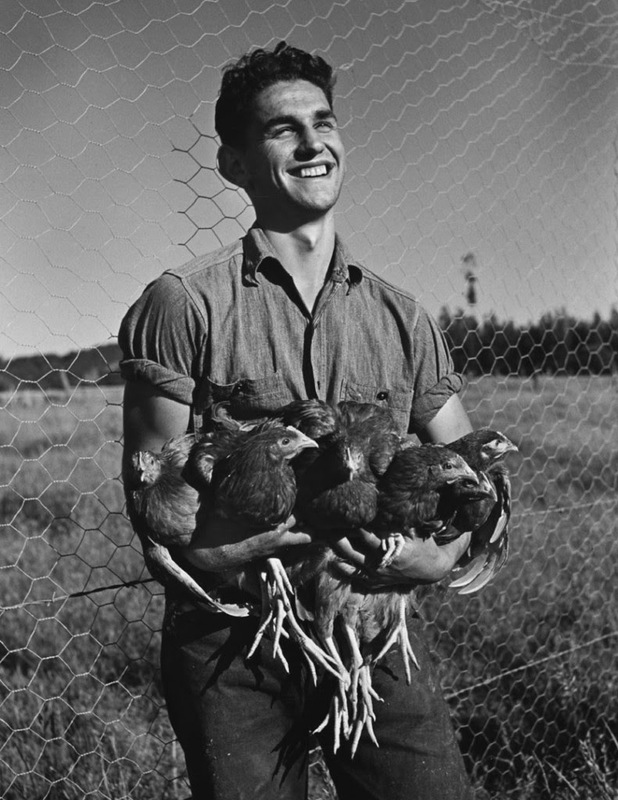 Men are remembering that “husband” means “house-bound” and that the word is also used to describe caring for the farm – “husbandry”. Farming and fatherhood just go together. I think the coals left from a more vibrantly burning culture of community, land, and God are being blown. And it’s getting warmer out here. I know some who have made it in a farming enterprise and others that have failed; I know those that stopped at the backyard gardening and others who homestead and live in a tiny house off-grid. I know some who left the city and returned jaded by the whole thing. It’s not for everyone. But it is for some, and those that try don’t regret it. And I think some of it – like the integration family, land, and God- is good for all. My point here is to say this: your dream is good, that desire is there for good reasons, and I encourage you to get your hands dirty. If the world seems too cold and lonely, maybe you just need to warm it up with a good tall compost pile. Contemplative Occupation and the Fight to Think. St. Francis De Sales is one of the doctors of the Church (as well as an Oratorian!). His “Introduction to the Devout Life”, which was the basis for him being named a Doctor of the Church, is still appropriate today to those who live in the world who seek holiness. He stressed others to focus on removing mortal sin from one’s life as a prerequisite to becoming holy. He also was a prolific converter of protestants (mostly calvinists). We need his skills today more than ever. St. Francis De Sales, ora pro nobis. The blog post from traditionalcatholicpriest.com mirrors our thoughts exactly on the “Big Game” on Sunday. Sports used to be a leisurely activity that took one’s mind off life for a moment. Now it has become a religion for most and THE ONLY THING people want to talk about at work. More signs of the apocalypse :)! There is no doubt this age we live in is one that affords us many advancements technologically, scientifically, in the field of health care, to name just a few, and the list grows with each day. People have more, do more, live “better” and longer. But I wonder if many others see this age as one with an infinitely greater number of challenges and barriers between them and their sacred origins, God Himself. Is it harder to achieve life everlasting with our Maker in the modern world? I would say indeed it is, though for reasons perhaps different than those that initially spring to mind. St. Peter Nolasco fought the Albigensian heresy in southern France. He was also part of the struggle against the muslim occupation of Spain in the 1200s. Today also commemorates St. Agnes’ birthday which is the second feast of hers only 8 days after her first feast day. Click on the link below to receive a section of St. Thomas Aquinas’ brilliant synthesis and analysis of Christian thought, the Summa Theologiae, to read each day via e-mail. Today is his feast day in the novus ordo calender. St. Thomas Aquinas, ora pro nobis. This Saint has been called the greatest preacher that has ever lived.